Mike Taylor may represent the bridge to America's job skills gap. He went to a 4-year college and then waited tables at a restaurant even as he struggled to pay off college loans. Two years later, he did what many Americans are doing less and less: he became an apprentice. There are 5.8 million job openings in the United States -- a record high number. It's a positive, and indicates that companies are hiring. But hidden behind the huge number of job openings is the fact many Americans don't have the skills to fill them. One possible solution is apprenticeships like Taylor's. You get paid while you learn and work. What's better is you complete an apprenticeship with no student debt and some of those skilled jobs pay better than entry level positions on Wall Street. "Apprenticeship is the other college, except without the debt," U.S. Secretary of Labor Tom Perez told CNNMoney. President Obama is betting on apprenticeships to help bridge the job skills gap. His administration set aside $175 million in grants -- the largest ever federal grant program for apprenticeships. A native of Hazlet, NJ, Taylor left New York's St. John's University with $75,000 in student loan debt. He knew that making ends meet while paying off his mountain of debt wouldn't be feasible on a job waiting tables. He thought about being a cop in 2009 but no one was hiring during the Great Recession. Mike Taylor, 28, in his plumbing apprentice class in Queens, N.Y. Apprentices who finish the program make $117,000 in their first year. Taylor is now in a 5-year apprentice program at Plumbers Local 1 in Queens, N.Y. Every two weeks, he attends class one day and works nine days -- each of those days, including his class, are paid for by the program. Wages may not be growing across the country, but they are growing for many apprentices. Taylor makes $28 an hour. Next year, as his skills improve, he will make $42 an hour. Taylor has paid down much of his student loan debt and he bought a house in Hazlet, NJ, last year with his wife, who's expecting their first child. When Taylor finishes the apprenticeship, he can opt to take a few more classes to obtain an associates degree -- all paid for by the apprenticeship program. "I wish I would've done this sooner," says Taylor. "How many 28-year old kids do you know that can actually own a home?" Taylor and other plumbing apprentices, like Nick Broadbent (pictured above), make $117,000 on average in their first year out of the program. That's right: plumbers pull in more fixing pipes at Wall Street banks than entry level bankers. "Rightfully so, we have more skills than the bankers," quipped Chris Pancia, another apprentice at Plumbers Local 1. Apprenticeships appear to be gaining momentum this year, but it hasn't been always been that way. In fact, between 2002 and 2013, the number of apprentices in the U.S. dropped from 469,000 to 288,000, according to the Labor Department, as the programs were slashed. Labor unions have historically funded apprenticeship programs -- not the federal government. And as labor unions have lost bargaining power over time, funding and popularity for apprenticeships has whittled down. A push to send more high schoolers to 4-year colleges and budget cuts during the recession didn't help either. "As the country goes more and more non-union, these opportunities have disappeared," says Arthur Klock, director of the Plumber Local 1 apprenticeship. Apprenticeships aren't that easy to get in either. 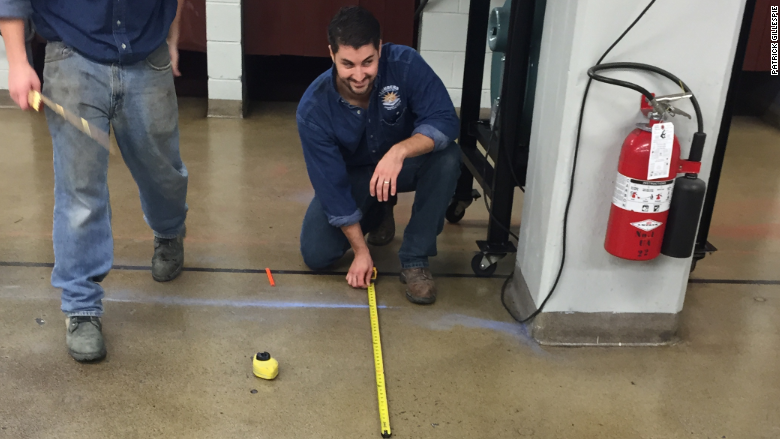 Klock's apprenticeship has about 500 spots, but he routinely gets 2,000 applicants. Some apprentices like Broadbent camp outside for three days just to get an application in. Klock says his program has a 90% completion rate. Apprenticeships are not without fault. Not all apprentices go on to 6-figure salary jobs. Some programs are heavily skewed towards white men. Programs like Plumber Local 1 have made a push to include more minorities and women. Still, apprenticeships nationwide tend to lack diversity. Klock argues that he tries to recruit women and gets laughed at. However, there are women like Brandi Dunham, a Milwaukee native and big Green Bay Packers fan. "You can't live in Milwaukee and not be a fan," she says. Dunham took online college courses with the University of Phoenix in 2006 and took on student debt. Dunham worked for nine years as a bank teller making $22,000 a year. Eager for a change and a raise, Dunham applied to be an assembly worker at Hayes Brake, a Milwaukee-area company that makes brakes for motorcycles and farming equipment. Hayes offered to pay for Dunham to take an 18-month apprenticeship program while she worked. Dunham, 32, finished last year and now makes $37,000 a year. Dunham wants to make more -- and she expects she will -- but it's a big boost from her days as a bank teller, and she gets to spend weekends with her 17-year-old son -- something she didn't have at the bank. 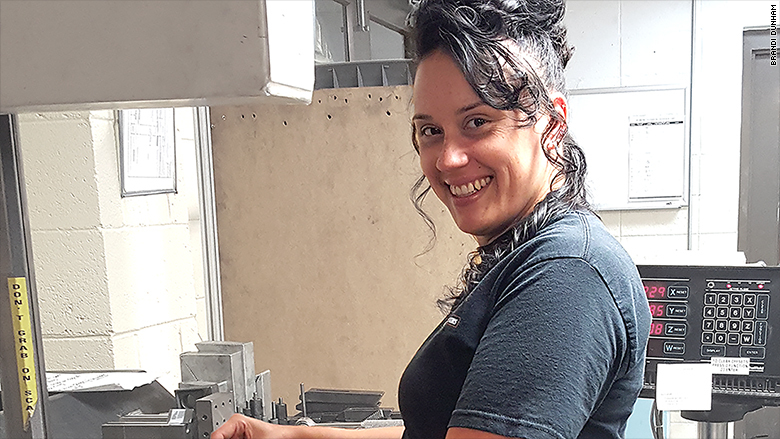 Milwaukee native Brandi Dunham got a 70% increase in wages after an 18-month apprenticeship program. Related: The Obama economy has problems. Does the G.O.P. have answers? 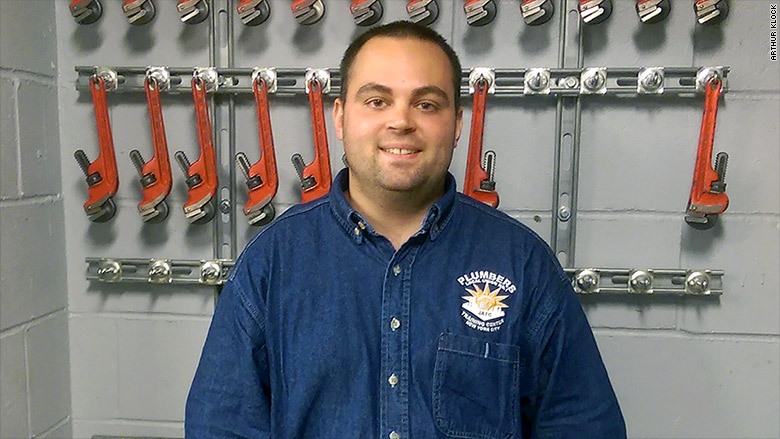 "I was new to the whole factory setting...with the class I was able to learn a lot of different things," says Dunham. There are some downsides. Some say they feel under appreciated by their customers and sense a negative stigma about hands-on work from the desk job workers. Stigmas aside, apprentices say their training and career track is putting them on the path to the middle class. It could help bridge another gap: income inequality. "The pay is good, often better than a college grad can earn out of the gate. This opens the door to closing income gaps," says Diane Swonk, chief economist at Mesirow Financial in Chicago. "Not everyone is built for a [4-year] college degree."